Big Finish: Doctor Who - THE DOCTOR'S TALE Review | Warped Factor - Words in the Key of Geek. If there’s a marker that sets the Hartnell era apart from every other in the history of Doctor Who, it’s the storytelling duality of its nature. As envisioned by Sydney Newman, it would be a science-fiction show, absolutely, but it also had two teaching remits – it would teach the children in the audience about science, but it would also teach them, as well as it could, about history. Hence the existence, only really within the Hartnell universe, of the pure historical, a story where history itself provided the danger, the thrill, the puzzle. The Troughton team tried it only once (although it was an important once, the Highlanders introducing us to longstanding companion Jamie McCrimmon), before abandoning the pure historical due to significant ratings dips for stories that lacked what Newman called BEMs (Bug-Eyed Monsters). The pure historical has never really made a comeback on screen (Black Orchid – ahem), though there have been plenty of historical-plus-alien-shenanigans stories, right up to Series 9 of New Who with The Girl Who Died and The Woman Who Lived. But for pure history in on-screen Who, you’re looking at William Hartnell, from the admittedly ropey Tribe of Gum through stories with much greater complexity and teaching power, like The Aztecs, Marco Polo, The Crusaders, The Reign of Terror, The Massacre of St Bartholomew’s Eve and The Smugglers. Big Finish has never had any of the qualms of the TV show when it comes to reviving the pure historical, and getting any number of Doctors involved in real world history. 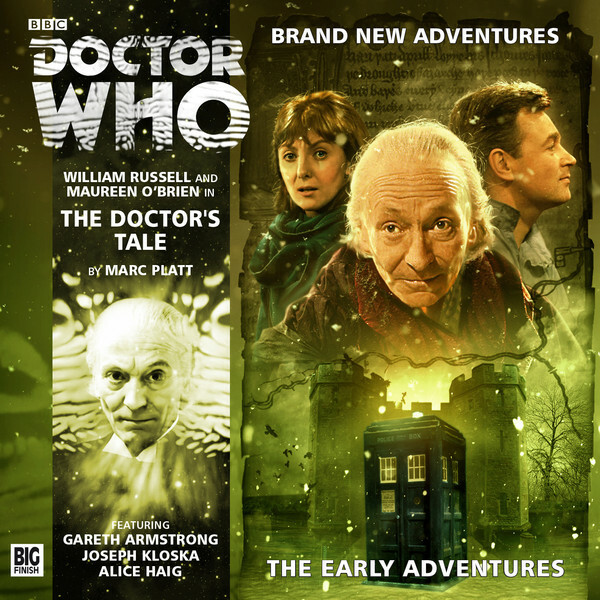 But for the second of the Early Adventures, what it delivers is absolutely classic, by the books Hartnellian history in The Doctor’s Tale, by Marc Platt. Welcome to England in 1400. A turbulent time? Check. The events of this time would sew a blood-soaked seed in the history of England and the world. Henry IV was the first king in at least two hundred years to usurp the throne of England, in his case from the lavish, whimsical and cruel Richard II. It was a reminder to an England that had forgotten that kings could be usurped, that the will to power and a sanity in governance was more important than any divine ordination – the will of the Almighty being deemed to favour the victor, whoever they were. From Henry IV’s usurpation came the seed, two kings later, when England was once again faced with an ineffective king, of the Wars of the Roses, when Henry VI was deposed by Edward IV, himself deposed in favour of Henry again, and back to Edward during the course of the increasingly interminable battle between the so-called Yorkists and Lancastrians. It was the example that finally ended the Wars of the Roses with the usurpation of the crown by yet another Henry, Henry VII, which in turn set the seal on the Tudor dynasty, on Henry VIII, on Mary and Elizabeth and on everything that followed them. Historical pivot point – check. Marc ‘Ghost Light’ Platt might seem an unusual choice to write a pure historical – his scripts have a tendency towards the esoteric, the thematic and metaphorical, rather than anything quite as gritty and straightforward and human as the pure historical demands, but as it turns out, Platt knows the mechanics of the Hartnell historical exceptionally well. It could be seen as a slight perversity, given the freedom of the audio medium, that he clings firmly to the structural requirements of the TV medium to get his story across – lots of people hiding behind pillars, overhearing things, whispering treacherous plans, and building the tension like a spiderweb until the moment when giant, potentially history-altering traps are sprung or moves are made and everything goes totally tonto with dramatic punch. But the point of doing all that here is to evoke that very familiar, very particular sense of Hartnell history stories, but with an energy that’s distinctly 21st century. With the Tardis travellers caught up in royal life-or-death drama in what is essentially a palatial prison as the questions of Henry IV’s security on the throne and the idea of Richard’s re-instatement raised, there are whispers round every buttress, a murderous archbishop on the loose and a great historical celebrity appearance from none other than Geoffrey Chaucer. Platt fills his two hours with incident and turns his taste for mind-boggling complexity to the genuine fabric of history – human interaction. He also evokes the Hartnell historicals by giving each of the characters a particular strand of the problem to solve, a particular level of involvement with particular characters. The Doctor and Barbara stick rather closer together here than in some of the on-screen historicals, seeming to have reached an accord on the immutability of history after their previous adventures, while Vicki, in typical fashion, hob-nobs with royalty, and Ian gets entangled in a web of intrigue alongside Chaucer – which includes daring rescues, dungeon plots and unbridled derring-do from Sir Ian of Jaffa. What’s more, Platt delivers a Hartnell Doctor with some of the Sixties episodic blether stripped away. A Doctor who realises the dangers of their situation, assesses real human psychology and uses a range of techniques and tactics, tricks and twinkles to get everyone where he needs them to be. Platt’s script takes the essence of everything you remember about the Hartnell Doctor, and then compresses is into a polished Doctor-diamond, meaning the Hartnell character shines through with a modern sharpness. William Russell again does double duty as Ian Chesterton (and incidentally, considering Russell’s age when the story was recorded, it’s amazing he delivers a Chesterton as close to the fifty-years-ago version as he does) and the First Doctor, and Maureen O’Brien doubles as Vicki (honestly, you’d barely know time had passed when she drops into squeaky teenager mode) and Barbara, so the story gives the sense of a much fuller Tardis crew than are actually still with us. Gareth Armstrong turns in a rugged Chaucer, while differentiating him from the likes of Paul Bettany’s interpretation in A Knight’s Tale, and John Banks delivers an unusually intense turn as Thomas Arundel, the chief driver of the drama, meaning The Doctor’s Tale is rich with both period atmosphere and human drama. Is it perfect? That depends on your definition, because what Platt also gets into this audio is the sense of real-time, long-term hanging about that was sometimes responsible for the dip in viewing figures in the mid-section of stories like Marco Polo. Here, the Doctor takes a job as a tutor for a while and you get that sense of the drama stalling, waiting to break. Whether that works for you in the audio medium depends on your familiarity with the original Hartnell historicals, but it would be difficult to argue that that sense of real passing time wasn’t a fundamental part of their charm to Classic fans, so the period of languor in The Doctor’s Tale helps deliver the evocation of the Hartnell historicals even down to the elements that weren’t so popular. Fifty years on, most listeners will regard the pauses as elements of authenticity, rather than the screen-filler they were back in the Sixties. All told then, The Doctor’s Tale is highly polished Hartnell historical, with all the complication, treachery, double-dealing and derring-do you could wish for, and William Russell’s take on the First Doctor shining through a script that takes everything you remember about the Hartnell incarnation and delivers it in spades.